In Fabula-divino on sale now! It's just been a few hours since the 2013 Speculative Fiction Festival at the NSW Writers' Centre. I must say that I enjoyed the day a lot. However, how did my plans go? 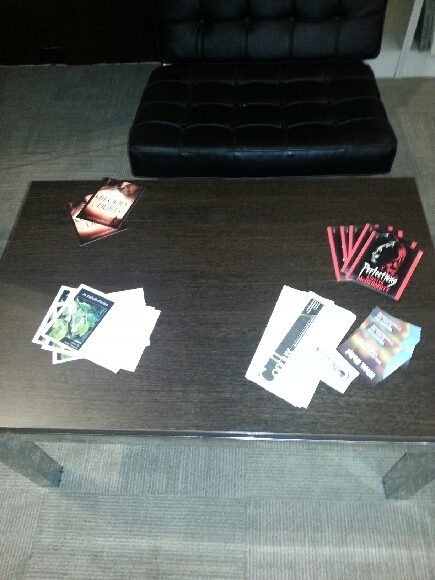 Handing out flyers: When I arrived I saw that others had there promo flyers on the tables in the foyer, so I followed this example. You can see an example of a table. I kept some flyers to give to anyone I happened to chat with who seemed interested. 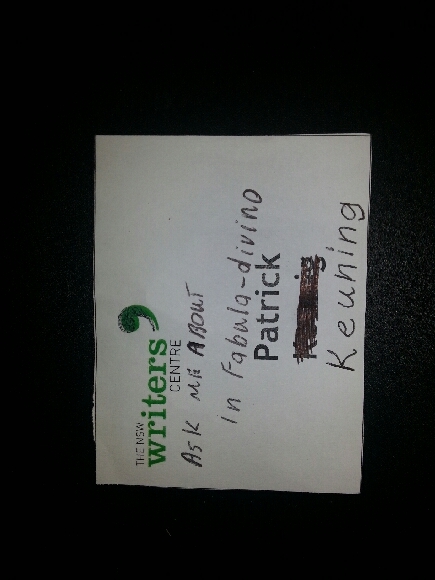 I then had this idea to see if I could get people to ask me about In Fabula-divino. With a rush of inspiration I wrote, 'Ask me about In Fabula-divino', on my name tag. Now my last name had been miss spelt on my name tag, so I'd already scribbled that out and wrote the correct spelling. This left my name tag in a bit of a mess and I'm not sure that it helped. Meeting and talking: I did a bit of meeting and talking. I met Angela Slatter in the coffee line and we talked briefly about In Fabula-divino. I met and chatted Jason Nahrung, and then down loaded his new book, 'Blood and Dust', to my Kindle using the free Wifi at the centre. I also briefly chatted with Richard Harland and saw a copy of his, soon to be released, next book. Meet Mark Webb: I did met Mark and we had a good long chat at the end of the day.